A standpipe is a portable device used to draw water directly from a fire hydrant on watermains. Contractors who work on the public water network may apply to use a standpipe if they can show that taking water from a hydrant is the only way to source water. You must show that taking water from a hydrant is the only way to source water for your purposes. 2. If we approve your application, we send you an invoice. 3. You pay the hire charge. 4. We email you with the standpipe pickup location. 5. When you collect the standpipe, you sign our agreement and receive the standpipe user guide (PDF). How do I use a standpipe? For operating instructions and maintenance, download the standpipe user guide (PDF). Only Watercare’s standpipes (metered and with backflow prevention devices) can be used on our network, including testing flow and pressure. The only exemption is for the New Zealand Fire Service. Standpipes are not permitted in the Franklin and Rodney areas. 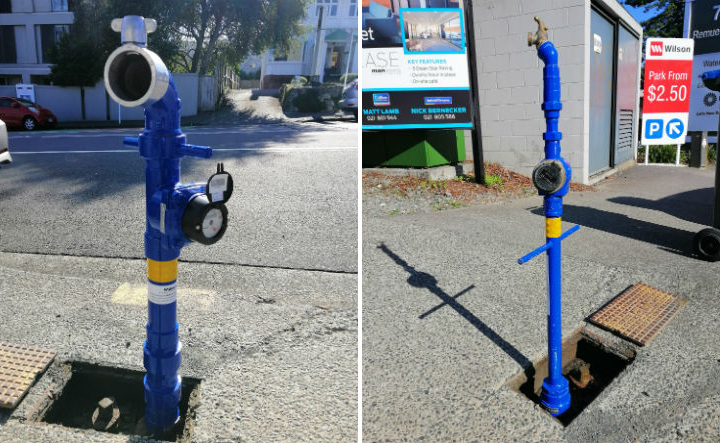 Our standpipes are not to be used after metered connections. We reserve the right to approve or reject applications to draw water from hydrants on our network. All hire agreements are for one year. Short-term hire is not permitted. You must report your previous month’s water meter reading, including zero consumption,before the 10th of the current month. Timely reporting is critical to the effective management of our standpipes. If you fail to supply readings, we will begin the process to retrieve the standpipe. All customers receive a web link around the 15th of each month, for reporting the previous month’s reading. Phone us on (09) 539 8402, stating your standpipe ID number and meter reading. Complete and send us the water consumption report. We bill you monthly, based on your water use in the previous month.